We might not have seen any new bracelet winners in Monday’s 2018 World Series of Poker action, but we did see two exciting final tables set for tomorrow. Both the $10K PLO Championship and the $1,500 Razz will return tomorrow with all players around one table, and they won’t stop until two shiny new bracelets are handed out. Meanwhile, the MONSTER STACK ploughed through another day and hundreds of players, and the $10K Limit Hold’em Championship kicked off. 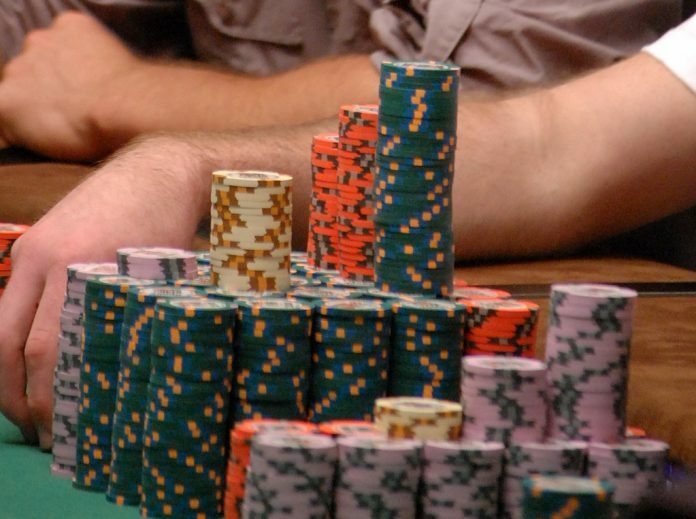 Here’s everything you need to know about June 25 at the WSOP. Brandon Shack-Harris seems to always rise to the occasion within the halls of the Rio. Over the years he has amassed 30 WSOP cashes, adding up to $2.8 million in earnings, and he’s won two bracelets. He’s now in prime position to bag a third. Shack-Harris will return tomorrow as the chip leader in Event #49: $10,000 Pot-Limit Omaha 8-Handed Championship, ending the day with 7,730,000. He’s got tough competition from the likes of fellow two-time bracelet winners Ryan Hughes (5,140,000) and Loren Klein (4,240,000), as well as three-time bracelet winner Rep Porter (2,680,000), former November Niner Jerry Wong (2,150,000), and recent bracelet winner Scott Bohlman (1,855,000). A few notables we lost during the day include Scotty Nguyen, Anton Morgenstern, Anton Tsang, Ryan Laplante, Mike Leah, and Poker Life Podcast host Joey Ingram. Ingram doesn’t usually play tournaments, preferring to play cash games, but his 17th place finish for $28,502 marks his biggest career cash. The final table kicks off at 2pm tomorrow. There’s a $1,018,336 first-place prize awaiting the winner, while everyone has now locked up a nice payday of $157,097. The second final table to be set on Monday was in Event #46: $1,500 Razz. They’re down to the final nine, with Kevin Iacofano and Michael Mckenna holding the top two counts, with 514,000 and 477,000 respectively. However, it’s PocketFivers Adam ‘adamyid’ Owen and Dzmitry ‘Colisea’ Urbanovich who we’ll be keeping a close eye on. They come in fourth (Adam) and seventh (Urbanovich) in chips, and the mixed game experts are both looking for their first piece of WSOP jewellery. In fact, nobody on this final table has won a bracelet, so we’re guaranteed a first-time winner tomorrow. That wouldn’t have been the case if any of the big names who went out today would have made it. The likes of Phil Hellmuth, Barry Greenstein, John Hennigan, Benjamin Scholl, Matt Grapenthien, Max Pescatori, and Brandon Cantu were just a few who went out before the bubble burst. When it did, we lost a few bracelet winners including Chris Bjorin (50th – $2,322), Benny Glaser (44th – $2,471), Cyndy Violette(39th – $2,471), John Cernuto (34th – $2,702), John Racener (33rd – $2,702) and Ylon Schwartz (26th – $3,034). There’s $125,431 and the bracelet for the winner, while all nine are guaranteed $7,881. Play resumes at 2pm Tuesday. There were 2,085 of the total entries 6,260 returning today for Day 2 of Event #48: $1,500 No-Limit Hold’em MONSTER STACK, but when play wrapped up today just 259 remaining. Two-time bracelet winner Steve Billirakis holds the overnight chip lead with 1,399,000. Next up in the counts are James Stewart (1,220,000), Raul Manzanares Lozano (1,176,000) and David Neiman (1,160,000). Others still in with a shot include Aditya Agarwal (1,100,000), bracelet winners Gaurav Raina (357,000), Jackie Glazier (275,000) and Nipun Java (101,000), as well as Jimmy Guerrero(940,000), Kurt Jewell (768,000) and Aliaksei Boika (597,000). We lost a whole lot of players in this one. The multiple bracelet winners who returned today, making the money but failing to find a bag at the end, include Alexandru Papazian (930th place), Jack Duong (886th place), Jared Hamby (837th place), Benjamin Zamani (833rd place), Athanasios Polychronopoulos (789th place), Peter Eichhardt (702nd place), Will Givens (676th place), Phillip Hui (670th place), Scott Davies (639th place), Blair Hinkle (626th place), Mark Radoja (589th place), Loni Harwood (521st place), Ryan Riess (520th place), Ronnie Bardah (487th place), Tuan Le (501st place), Calvin Anderson (423rd place), Dan Heimiller (412th place) and Alex Bilokur (359th place). The 259 players will return at 11am Tuesday with $5,140 locked up. The winner will receive $1,037,451. Event #51: $1,500 No-Limit Hold’em Bounty got going today, with 1,982 players creating a $2,675,700 prize pool. After ten levels on Day 1, 298 players have advanced to Tuesday’s Day 2. That means a whole lot of bounties have already been handed out. In this event, you get $500 for every player you eliminate, so if you bust three players, you’re already freerolling. The eventual winner will no doubt bank thousands in bounties alone, as well as picking up the $272,504 that’s reserved for first place. Right now the player closest to that is Alex Whitenstall (197,800), who bagged the chip lead. He’s followed by Ranno Sootla (171,000), Sean Getzwiller (143,000), Michael Steele (122,900) and Christian Nolte (121,900). Other notables who will return for Day 2 tomorrow include Paawan Bansal (98,700), Jeff Gross (78,500), brothers Ralph Massey (73,300) and Aaron Massey (72,300), Martin Mathis (70,400), Ivan Deyra (57,400) and Maria Konnikova (35,900). Where there are survivors there must be casualties, and some of those who handed their bounty chips over today include Phil Hellmuth, Sean Deeb, Kristen Bicknell, Alex Foxen, Phil Laak, Chris Ferguson, Bertrand Grospellier, Chris Moorman, Mohsin Charania, Joey Weissman, Allen Kessler, Anthony Reategui, Heidi May, Ben Yu and Maria Lampropulos. Action resumes at 12pm Tuesday. The bubble burst right at the day of play, meaning all players have secured $1,415. The next championship event on the schedule kicked off on Monday, with 101 players taking a shot in Event #52: $10,000 Limit Hold’em Championship. Leading the 43 survivors overnight is Michael Moore with 268,500, followed by Joao Vieira (211,000) Ofir Mor (205,000), and Nick Schulman (202,000). The latter of those four was one of the last entries, and certainly made up for lost time, while Mike Leah was the last one to get in. He too had a great short day of play, bagging up 125,000. Other notables who advanced include Anthony Zinno, Juha Helppi, Benny Glaser, Andre Akkari, Maria Ho, Chris Klodnicki, Ismael Bojang, Jeff Lisandro, and John Hennigan. The same can’t be said for Daniel Negreanu, Kevin Song, Erik Siedel, Shaun Deeb, James Obst, JC Tran, and Defending champion Joe McKeehen, all of whom hit the rail throughout the day. The 43 will be back at 2pm Tuesday for another day of Limit action. Registration is open until then. There are two new events ready and waiting to get started on Tuesday June 26. If you’re up early enough, at 11am you can hop into Event #53: $1,500 Pot-Limit Omaha Hi-Lo 8 or Better. Decide to have a lie in? At 3pm, you could play Event #54: Big Blind Antes $3,000 No-Limit Hold’em.